Have you ever tasted the sangria? Where did you take it? Was it in Spain or Portugal? If it wasn’t neither in Spain nor Portugal, you can’t really talk about sangria (sweet red wine blended with fruits) since last week the European Parliament established that true sangria just comes from these two countries. From now on, aromatized wines produced elsewhere will have to clearly state their country of origin on the labels. Sangria can only be sangria if it is made in Spain or Portugal, so such drinks can now only be sold under this denomination if they are produced on the Iberian peninsula. If it’s produced in other countries, it has to be sold under a different denomination and the word sangria can only appear as a complement of the denomination “aromatized wine-based drink”. The legislation was passed by a sizeable majority of MEPs, who supported the changes by 609 votes for with 72 against and four abstentions. European member states now have one year to incorporate the regulations into national law. As you all know, Spain is an important producer of all types of wines, such as white wine from Penedés, Rueda or Ribeiro or red wine from the Rioja or Ribera del Duero region. Cava (Spanish equivalent of the French champagne) is also sometimes called sparkling white wine. In Spain each bottle of wine is labelled with the name of the area from which the grapes were used, so we have come up with the D.O. System (denomination of origin), which is a quality control system guaranteeing the origin and class of grapes, as well as the methods used to produce these wines. Therefore, even though many people think of sangria as being a watered down sweetened version of drinking wine, they are truly mistaken and must pay sharp attention to choosing a medium to good wine when making their sangria recipe. 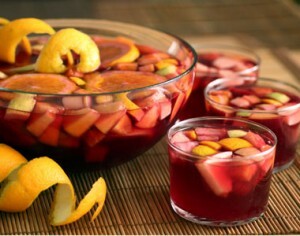 Sangria is a delicious fruit-based wine “punch” with its traditional heritage well rooted in Spain. Typically, sangrias are made with red wine, fresh, seasonal fruit and a bit of bubbly water or citrus flavored soda. It is easy to make and also easy to drink. Do you know that “sangría” comes from the Spanish word “sangre” (blood)? If you want to learn more about Spanish language and its culture, don’t hesitate to contact us. We’ll be pleased to help you!